Chengdu, one of China's most livable cities, recently held a fan-made comic convention called Chengdu ComicParty01. And where there are comics, there are cosplayers. 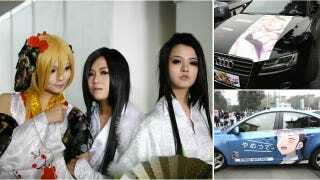 Japanese website Asagawo Blog has photos of the cosplayers and itasha (cars covered with anime-style stickers). While one of the itasha had incorrect Japanese written on it, it's great to see the country's otaku culture spreading its wings abroad and taking root in China. This is, of course, giving birth to an entirely new otaku subculture, with its own traditions, lingo, and quirks.